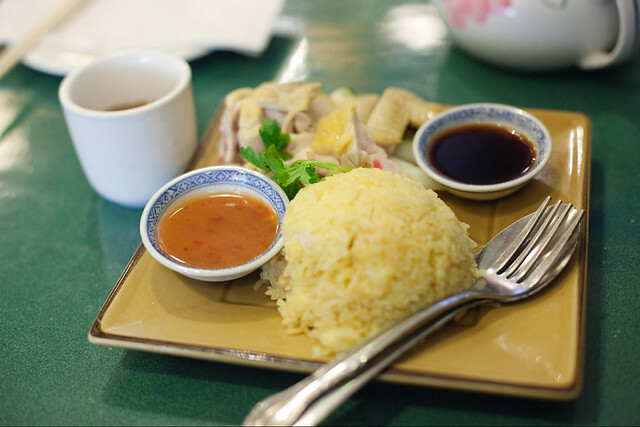 Ever since I moved to NYC, I have been searching for some good hainan chicken rice. It’s a very simple dish to make but somehow I rather go to a restaurant for it. My search so far hasn’t yield any good results. All of the hainan chicken rice I have tried in Chinatown, portion wise, small and the chicken were mostly bones. What I’m looking for is this! A big plate of delicious rice topped with boneless dark meat and served with a tasty spicy sauce. In LA a lot of Thai restaurants will serve this dish but not in NYC. I have only found chicken rice in Malaysian restaurants. The only good thing about the dish in NYC is that they’re cheap, like $4 cheap. The latest place I found to have hainan chicken rice is at Skyway Malaysian on Allen St. I randomly found a take-out menu in my drawer as I was cleaning my room. When I saw that they have the chicken dish I went for lunch the next day. When I placed my order, instead of asking me dark or white meat, the waitress asked bones or boneless. Interesting. I told her boneless will be great. While waiting for my dish I was watching Barefoot Contessa on their rather loud flatscreen tv. Moments later my dish arrived and I was sad to see that it was just like the other hainan chicken rice dish I had in NYC. Also there were bones in the chicken. The pieces of chicken were smooth and was delicious when dipped into the hot sauce and soy sauce. The rice tasted a little weird and nothing like the rice I had from other places. A little disappointed and was still hungry afterwards. I MIGHT go back just because I saw a deep fried hainan chicken rice on the menu.